It was supposed to happen right after the last day of the season, but now it takes place with a delay of four weeks: Looping Star leaves its ancestral place in the Belgian Bobbejaanland. 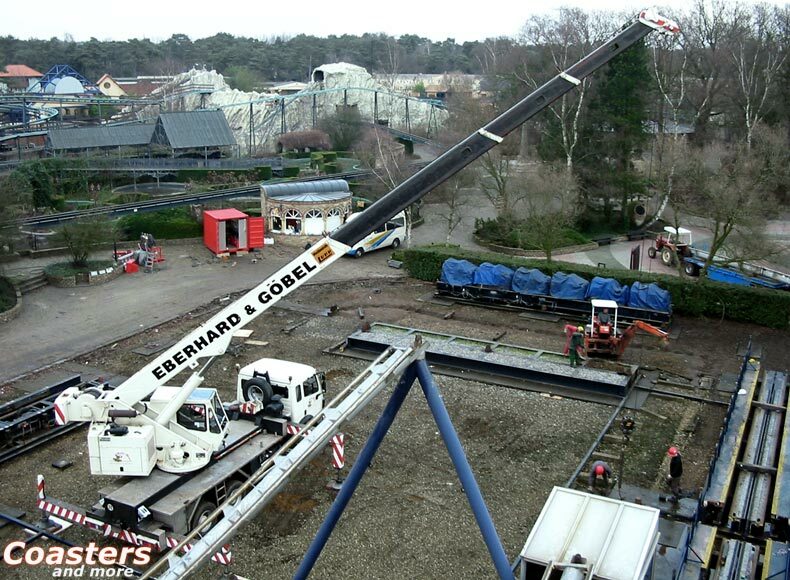 The dismantling is executed by the team of Ride Construction Service (RCS) around the company´s founder Max Eberhard (see the portrait below) to gain room for the novelty Typhoon. "A roller coaster can be dismantled or demolished." says Max Eberhard, and it quickly becomes obvious that he grants the first option to Looping Star. The track segments and support beams are pedanticly numbered and brought to a parking lot for interim storage. Whoever saw showmen building their rides might think that this is a job for just a few days. But this is far wrong: "Over the years a tension developed in the structure, and there is the corrosion, too. From the age of the ride, the size and the manufacturer you can make a pretty accurate estimate how long the dismantling will take." we are told by Ronald Schäfer, the chief of the building site. In the case of Looping Star this will be two weeks. "We´ve spent the first five days with preparations." adds Max Eberhard. "We removed the electrical and hydraulic components, entry and exit, the station and other smaller parts. 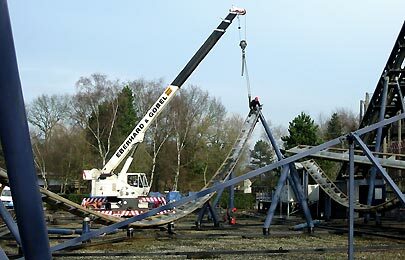 Removing the track and the support structure will take seven days, and two more days later you can barely see that here once stood a roller coaster." During the first five days most of the screws and bolts were removed. Many had to be freed from rust and persistant dirt with an angle grinder and oiled a couple of times before they could be detached. But the track isn´t any easier to remove. It can take more than 30 minutes until a piece can be hoisted out with the crane. "The transitions between the track segments and to the support beams are pretty seized up. We could loosen most of them, but in one case we had to use a flame cutter." Max Eberhard tells us. The parts are hoisted onto a trailer and brought to the parking lot. 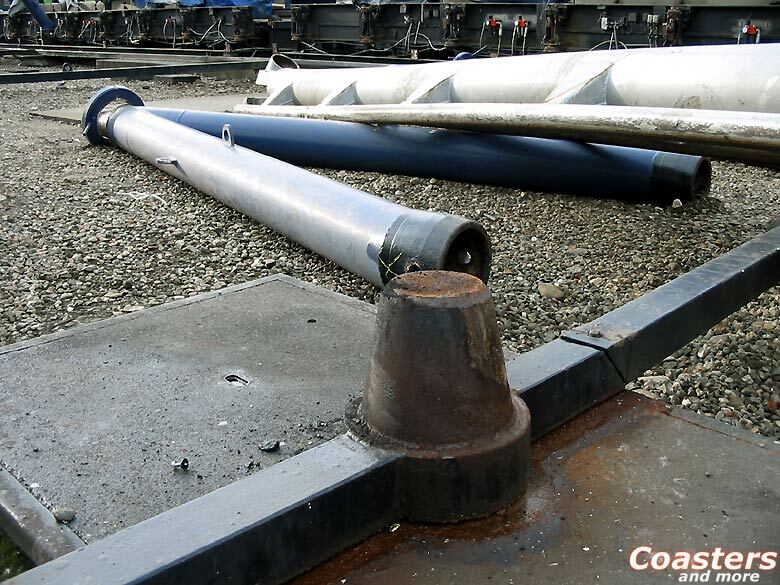 "We have 50 to 60 track segments, and each of them weighs between 1.5 and 3 tons." Ronald Schäfer reports. "The large pallets with the brake segments and parts of the trains reach up to 18 tons." Those parts have to be lifted with two cranes. 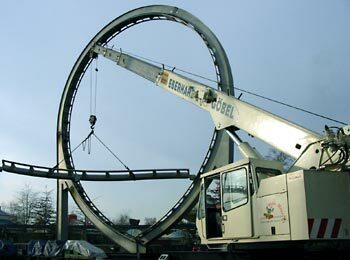 And it isn´t coincidental that they exactly fit on the trailer: "Schwarzkopf was very farsighted when he built the rides. All the pallets comply with the 44 feet norm for sea cargo containers, and even most of the track parts and support beams can be stored on the footprint of 12 times 2.5 meters." Schäfer tells us. So the team of eight workers removes one element after the other. 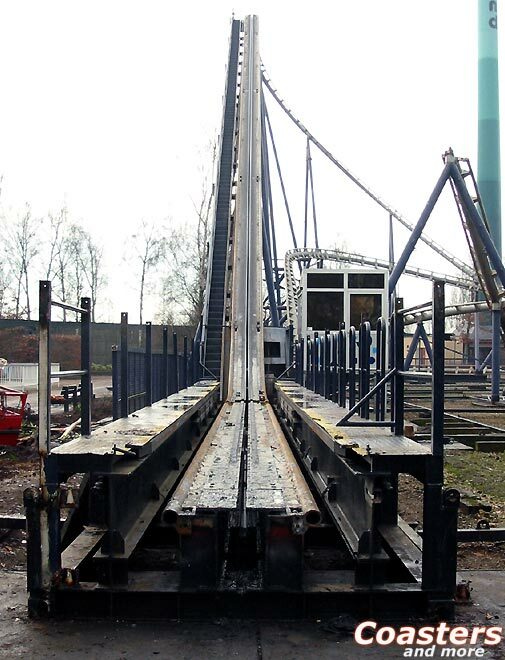 It isn´t decided yet what will happen to the coaster. Right now the focus is on clearing the area in time. 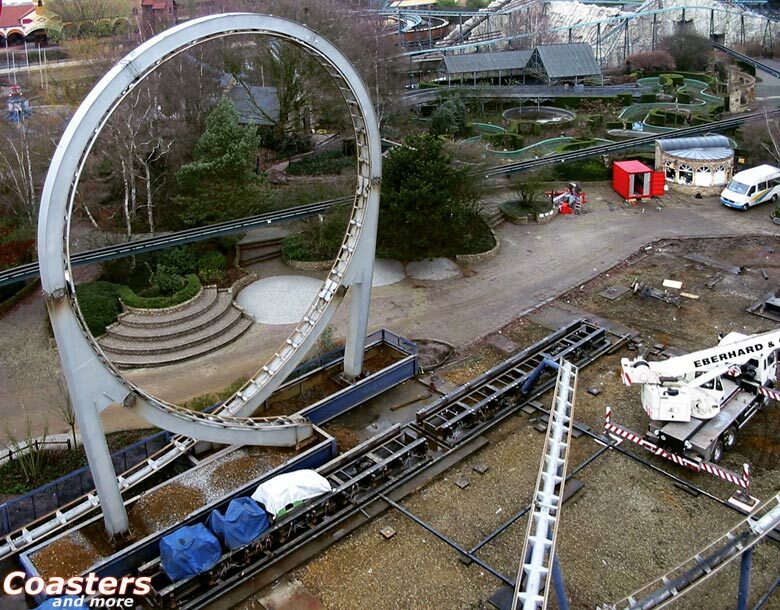 As soon as the last pieces of Looping Star will be removed, works on the foundation of Typhoon will begin. Around 100 piles have to be sunk into the ground. 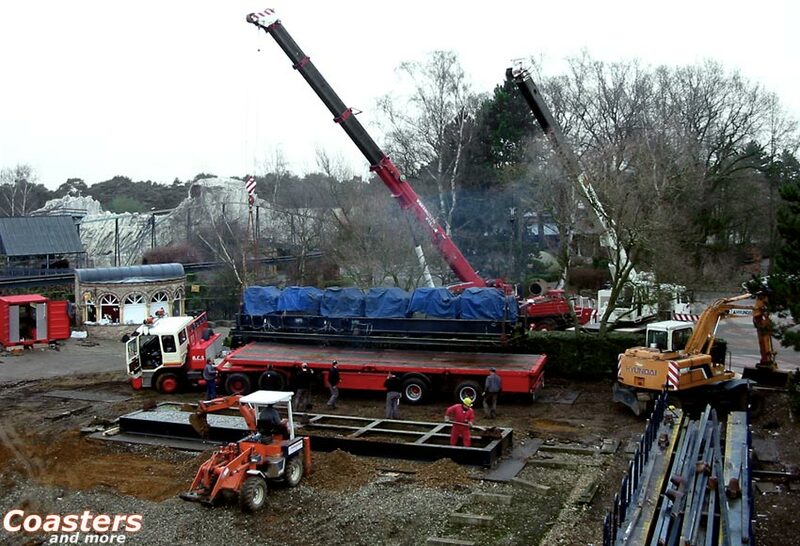 The 10 to 12 meters long concrete cuboids will be delivered by local companies and have to be handled by christmas. In the new year a 25 centimeters thick concrete slab will be cast over the whole footprint. "In the beginning we gained some time, but we directly lost it because of the uncertainty regarding Looping Star." we are told by Filip Bogaerts, the project manager responsible for Typhoon. 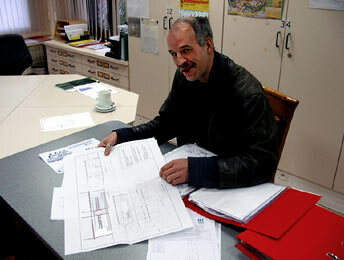 The studied architect and security advisor is working for Bobbejaanland as an external consultant since 1988. "But we are on time with all three attractions. 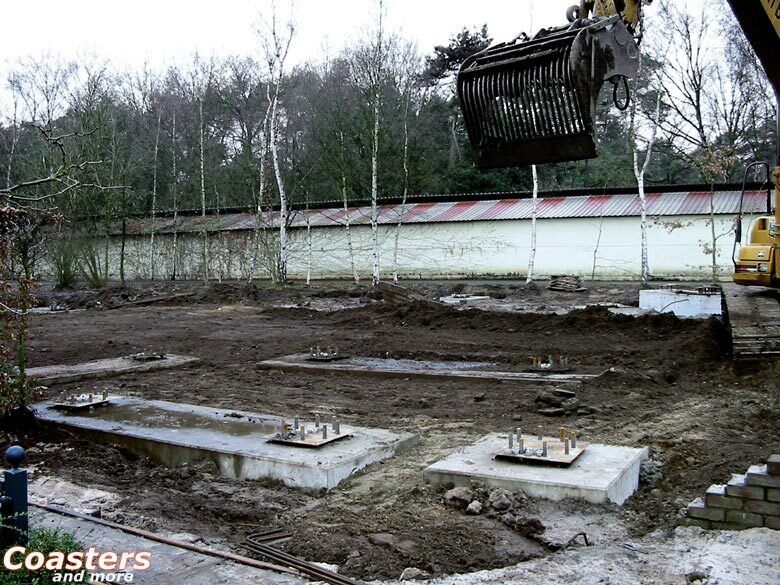 The foundation for the Vekoma junior coaster is almost done, the construction of the ride itself will start in the middle of January." One month later the Giant Frisbee delivered by Huss will follow, and in the first days of March the works on Typhoon will begin. 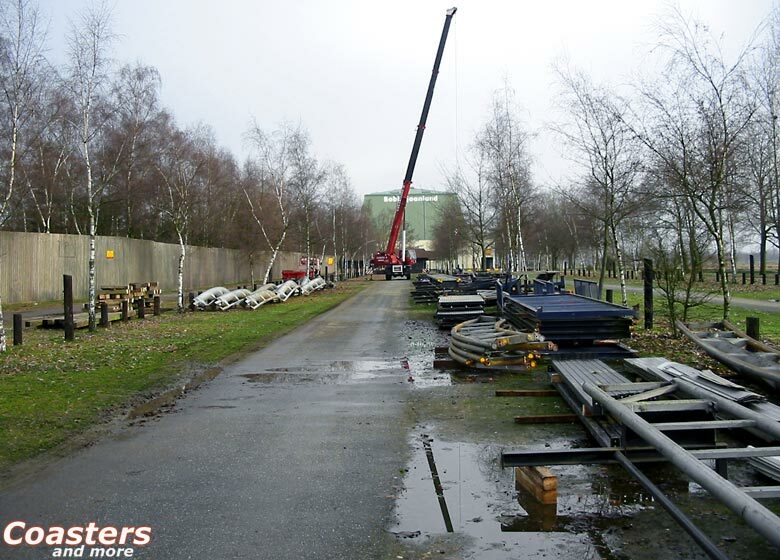 The new roller coaster has already taken the first obstacle: "Lately representatives of Gerstlauer and DNV were here to conduct the risk analysis." reports Bogaerts. During this analysis all possible faults are played through theoretically and the countermeasures are evaluated. Typhoon passed all tests of the safety engineers of Det Norske Veritas, the Norwegian equivalent to German TÜV, with flying colors. 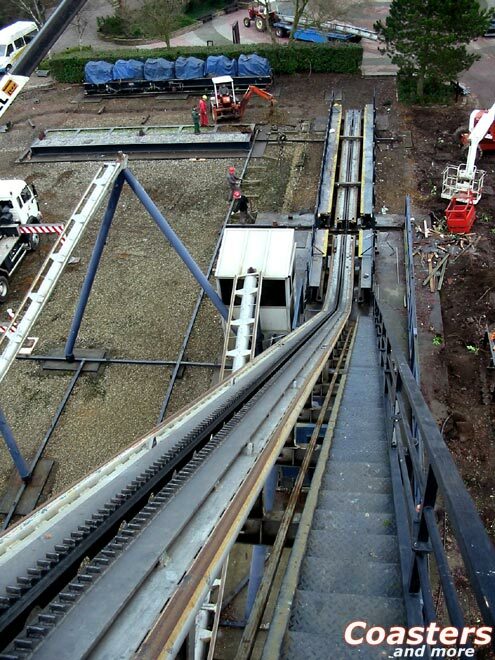 The next steps will be the TÜV approval and the first test runs on the site of Gerstlauer Elektro GmbH. 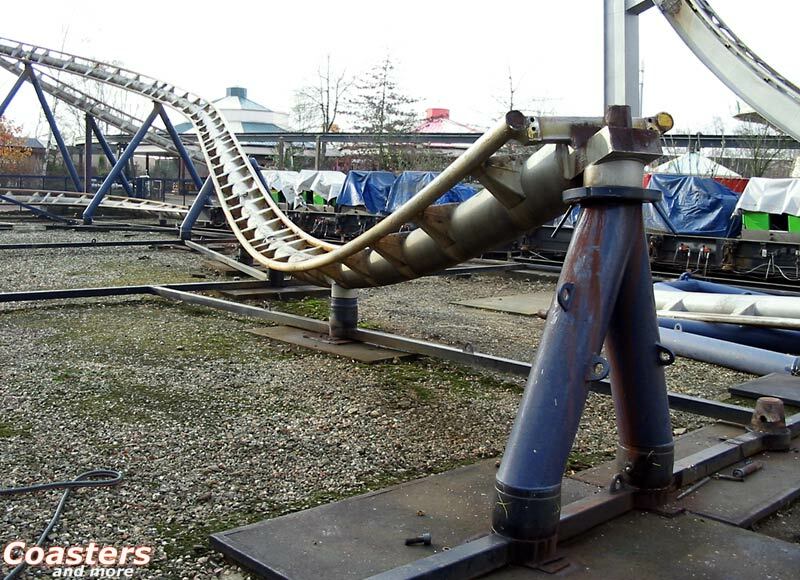 Coastersandmore.de will also report on this in the continuation of this article series. 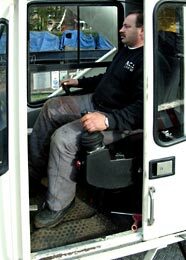 In 1999 Max Eberhard, born in 1975 and showman in the 8th generation, founded the company RCS. 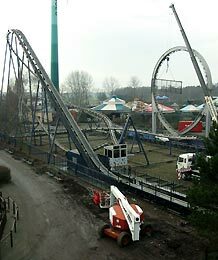 That year the roller coaster company Vekoma from the Netherlands sold the traveling ride Evolution owned by his father to Six Flags Great Adventure in the United States and was looking for somebody do construct it there. Eberhard realized that he found a gap in the market and specialized in constructing and dismantling roller coasters and other rides - in a time when many manufacturers sourced out subtasks like steel construction or the assembly of the attractions. One year later Ronald Schäfer, who can look back on 20 years of experience as a showman, joined in. 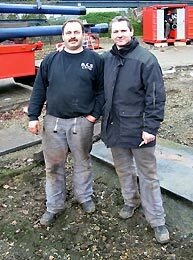 The two friends are a well-rehearsed team: While Eberhard is responsible for order acquisition, administration and establishing the construction sites, Schäfer´s job starts on location: "We trust each other blindly!" they tell unanimously. They have a permanent staff of 15 workers. 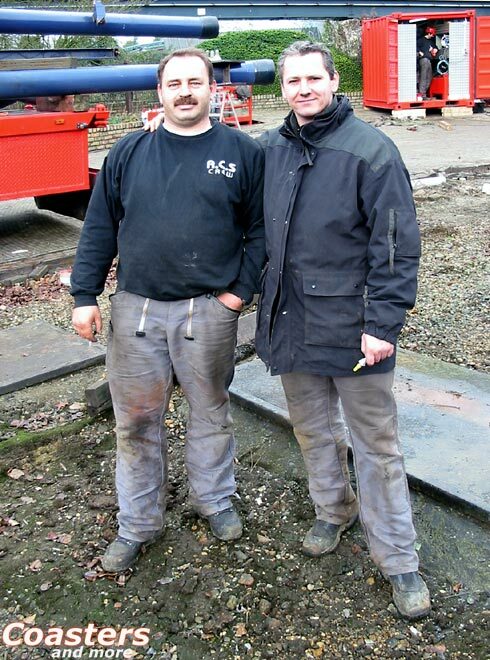 Each of them has his special subject, from welding and electrical equipment to precisely shunting the trailers. "But we already had up to 36 people on different sites at the same time." says Max Eberhard. His team has constructed more than 50 rides worldwide so far. Besides reliable and experienced workers especially the equipment is the vital asset of RCS. Apart from two 30-ton-cranes there is a HIAB on an own truck available. 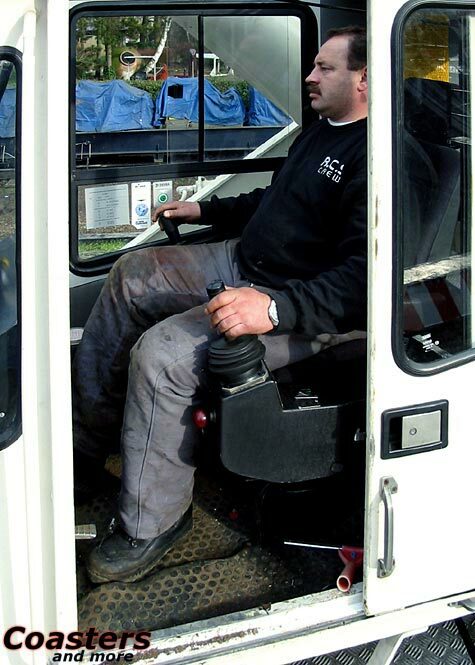 One of the cranes is equipped with an additional unit for cage usage, and the HIAB was upgraded with a wireless remote control. In addition, there are four trucks and four trailers. To complete the pool RCS owns two magazine containers and two for tools. "I have a tool fetish." Eberhard declares with a broad grin. "There is no special tool in our field we don´t have." One of those is a special press that locates the track segments in position for bolting them together, or a device to burst non-detachable nuts without damaging the screw thread. "We inspect and repair our vehicle fleet ourselves. And I set a high value on the appearance of our equipment." If there is a ride to construct, the manufacturer or the new owner contacts RCS. Considering the constructional drawing a time schedule and a cost estimate are made. "The plans can be called my homework." says Ronald Schäfer. "On my desk there is already a roller coaster for the US." More can´t be drawn from him. "Our clients expect reticence as well as professionalism on construction." And that is what they get. Many thanks to the team of Ride Construction Service and Bobbejaanland BV for the friendly support on realizing this article. The copyright for the pictures belongs to the photographers and Bobbejaanland BV respectively. Publishing, distribution and copying without written permission is strictly forbidden.